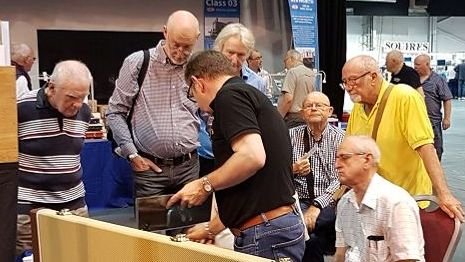 Looking forward to 2019 we have another busy year of exhibitions before us with bookings for five different club and members' layouts, so keep returning to see how we get on or drop into our clubrooms one evening and join in the fun. 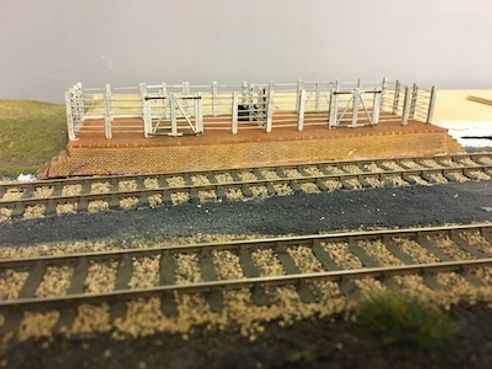 A bit of scenic work around the cattle dock - the retaning wall and surrounding ground contours and cover. 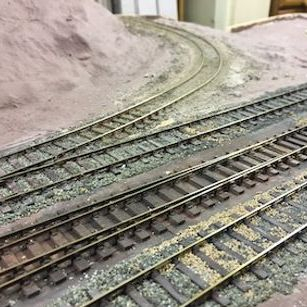 The work over the last few months painting and ballasting the trackwork, and forming the contours and then applying ground cover as starting to bear fruit. Be not afeared though the actual green shade is not as bright as it appears on these views. And having located ABB's cattle dock in position we are sorting out the ground works around it. 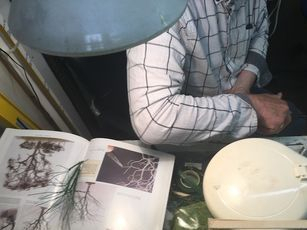 ABB has garnered two exhibition invitations for 2019 so we'll have to pull a few fingers out to get it ready. 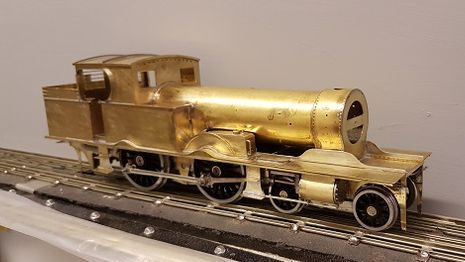 Meanwhile Wagonman has been busy with coaches. 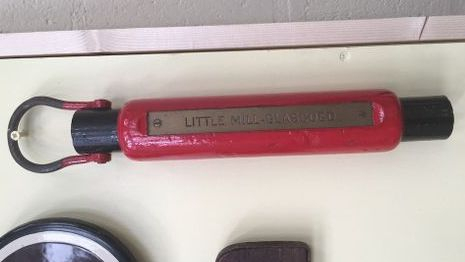 Both of these are of Midland origin. This is an all Third. And a Brake Third to go with it. 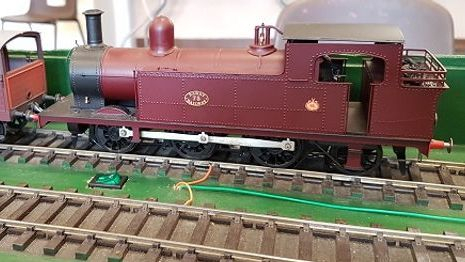 THey will be finished in BR maroon, so no fiddly lining of the panelling needs to be done. 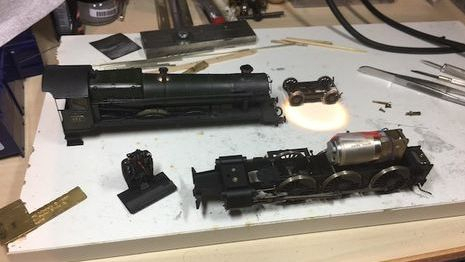 Both kits are from Haywood Models, but of slightly different generations. 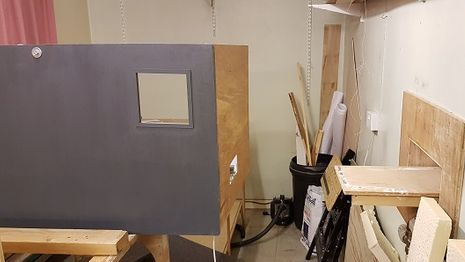 Note that on the left the door hinges are in place as there were etched slots in the sides. But there are no such slots on the right hand coach. 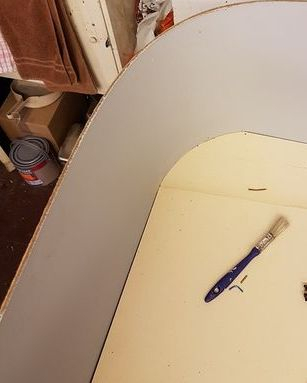 The hinges will have to be represented by short lengths of rod glued in place. 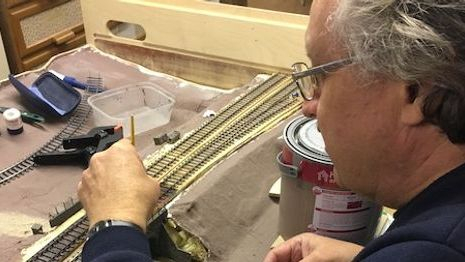 A good turn out on Friday with more progress on LMJ trackwork and ballasting with a start made on actuating some of the turnouts, while Mr Chairman was hard at it fettling and cleaning rolling stock for ABB. More on the brick works' siding. 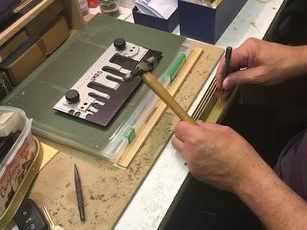 Seen here from above the soldering iron and track gauge are the key to what's happening here. 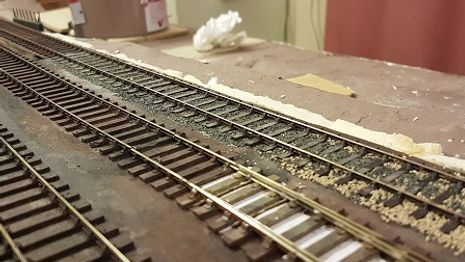 When I laid the track there was no thought of actually moving stock on this section. However, plans change, so now it needs to be accurate to gauge and LBH has been adjusting it. 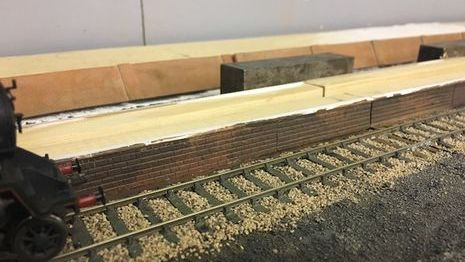 Here is the latest view of the siding having been ballasted and coloured. YTS has been building again. 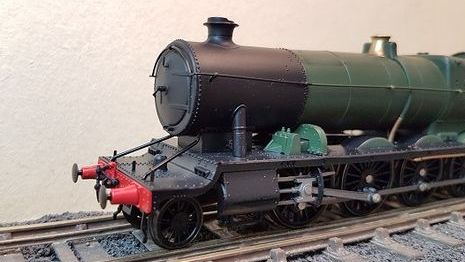 These locos are quite distinctive so you should identify it as an Adams Radial Tank. 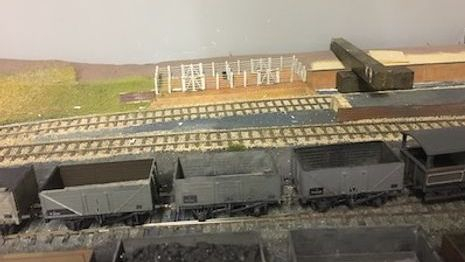 And he bedded in the cattle dock by ballasting up to the edge - and what you may erroneously think is the head of a screw on the LH foreground of the dock floor is in fact a location marker for a cow pat. 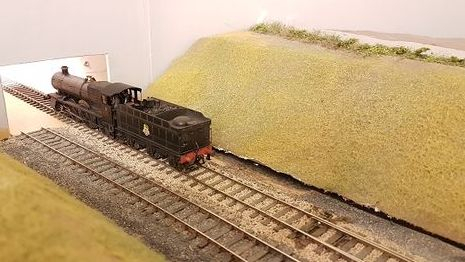 The tight-curve into the brick works (which we are taking to be rope-worked) well ballasted to above sleeper level. We layed down chinchiila dust and then ash. When it dries we'll vacuum off the excess. 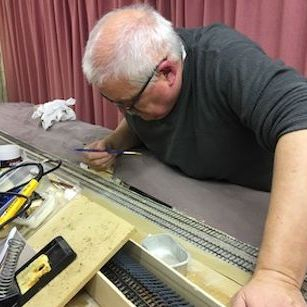 Here is Paul W wielding a paintbrush and easing the ballast into place grain-by-grain (well almost). And this is how we left things at end of play on Friday. 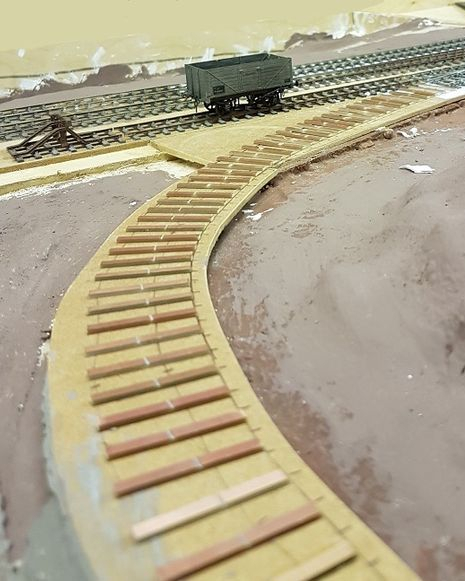 The line to the brick works at the top will need some more colouring and so will the main-line ballast to get it to tone in better. Only two pics to show you this week - Mr Chairman installed some half-chairs on the graceful C10 crossover on LMJ. And isn't the 'rope' in the wagon intriguing? And now we can see ABB's cattle dock without the weights - obviously a little more bedding-in needs to be done. A busy a Friday with plenty of activity on both ABB and LMJ and even a new member. 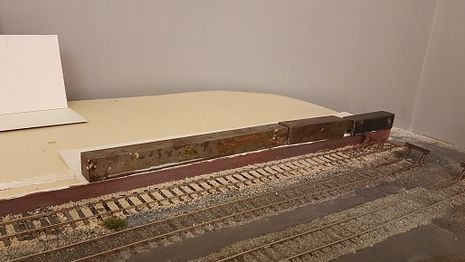 Some scenic progres on ABB as the cattle dock is firmly glued in place next to the Bay siding. The substantial weights are needed to hold the structure flat as it has warped a bit with an upward bow at the ends. This is always likely to happen when you have layers of plasticard stuck together. 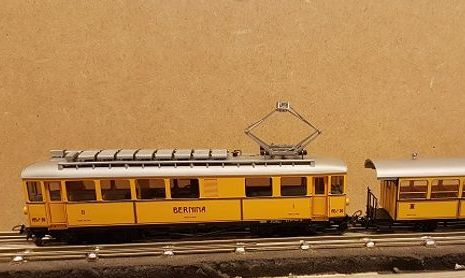 With plenty of bodies present, one of them a new member, trackpainting and ballasting proceeded along LMJ with more embankments as well. 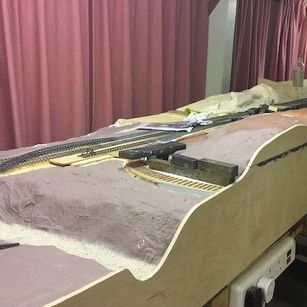 Following on from the trackwork on LMJ last week, ballast has been applied and glued in place. It can be a tedious task. Terra-forming on LMJ has gone beyond the signal box and is now heading north with the embankment towards the Usk road bridge. 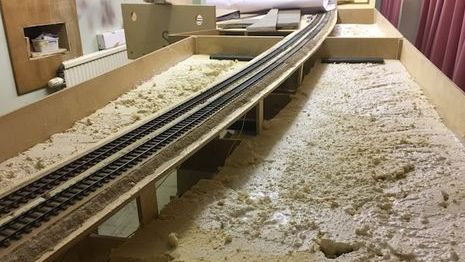 Meanwhile on ABB track has been laid between the scenic section, through the wall and onto the fiddle yard in the next room. 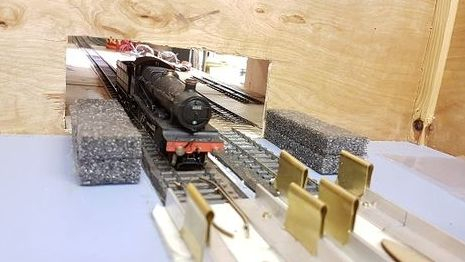 The Grange makes the first tenative steps off-scene . . .
. . . onto the bridging piece . . .
. . . through to the long room . . .
. . . and into the fiddle yard. By the end of the evening the second road had been laid in, though it's a bit more uneven at the moment. Followinng Morgan's minstrations (see 12 Oct) LBH's Nanhoran Hall returned for a very satistfactory run out on ABB. 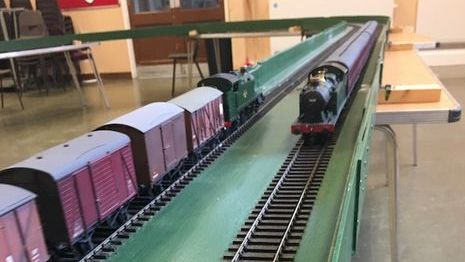 Wagonman has adjusted the ride height of the middle axles on the bogies of this 37 and here we see it passing its running trials. 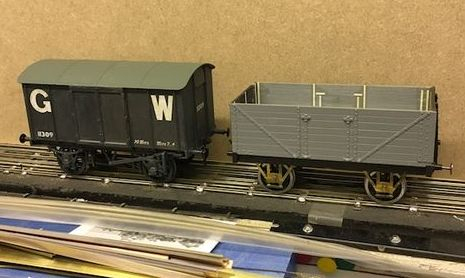 We've been following the progress of Wagonman's hopper wagons since July and here is the excellent culmination of all his work. Not content with one wagon he built a second for Mr Chairman. Apparently he has a further brace of kits so expect some more. 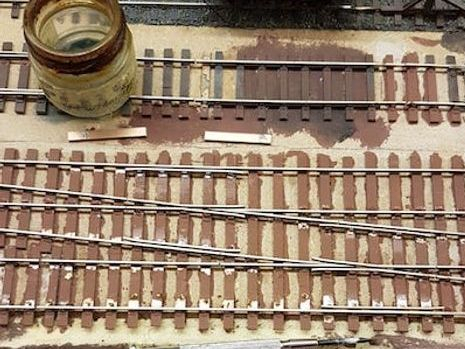 And here is Wagonman himself painting a stretch of trackwork on LMJ. 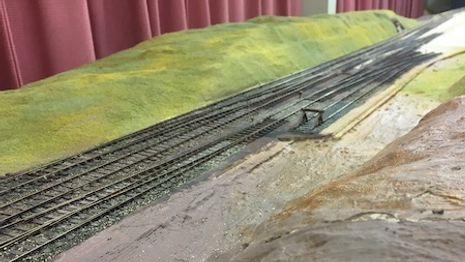 Look out for ballasting in further updates. A quiet evening as we are also at the Cheltenham Show this weekend. Fortuneatly there were three of us there as we needed to lift one of the reclaimed cupboards up onto its fixings. This will be used for electronic and electrical components which we seem to have quite a lot of. 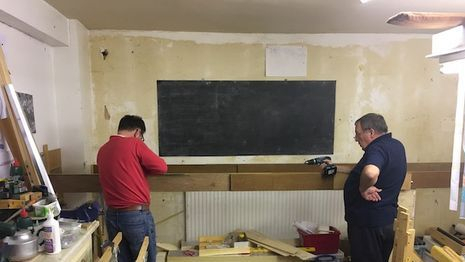 Back in the clubrooms this week and on Tuesday we (that is all except LBH who turned up after all the heavy work had been done) cleared out the temporary accommodation and stacked the displaced boards at the end of the layout room. 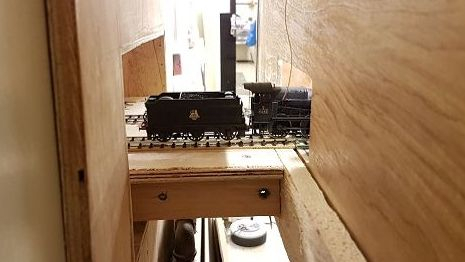 Luckily there was enough space to do this and still leave room for ABB's fiddle yard. 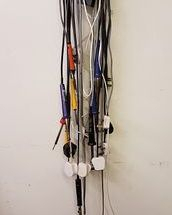 Whilst tidying up for all the board moving I found various soldering irons lying around and collected them all together. Not sure yet how many of them actually work! But Wagonman borrowed one as he had burnt out his current iron. and then in our chosen shade to represent the local shade of old red sandstone (ish). At this stage the gloss finish is just the paint yet to dry, rather than us trying to represent LMJ's microclimate. One of the causes of the broken soldering iron is this pair of coke hoppers Wagonman has been batch building. 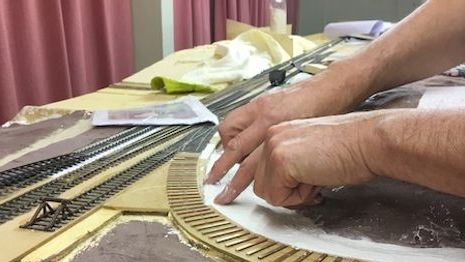 Work on ABB's platforms continues with the platform surface being glued and weighted down. 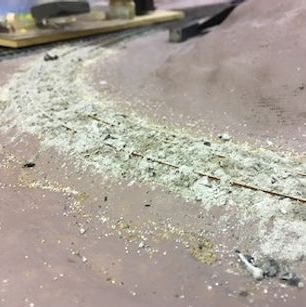 Not a duplicate pic but a fortnight on and Wagonman has modelled the mortar on the platform face with a wash of grey paint and LBH completed the ballast up to the face. Can you spot the difference? We visited Robin Whittle's magnum opus "Barrow Road" this Friday. 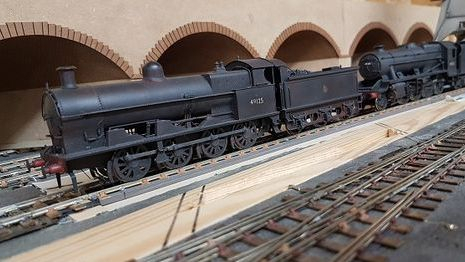 Based in Tewkesbury, its a 32ft by 16 ft P4 layout based around the LMS shed in Bristol, with the Midland mainline running past. 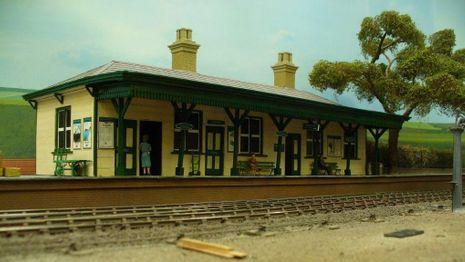 We don't have a photo of the main shed at the moment! The coaling tower is visible in the background. One of the aims of the visit was to give our P4 stock a bit of a test run over a good length of track. 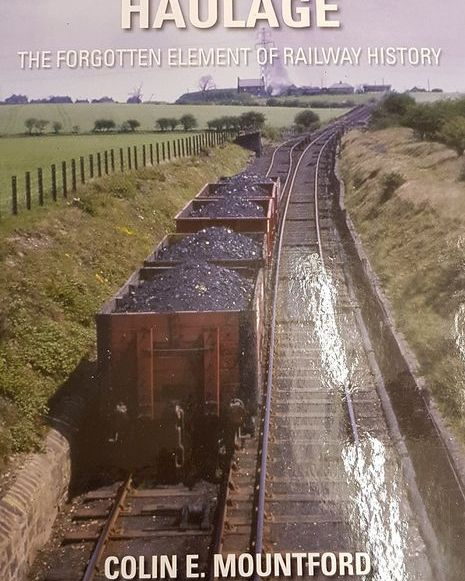 Here's a sample from MikeG, representing a Pontypool Road to Aberdare passenger as ran over the Vale of Neath line. 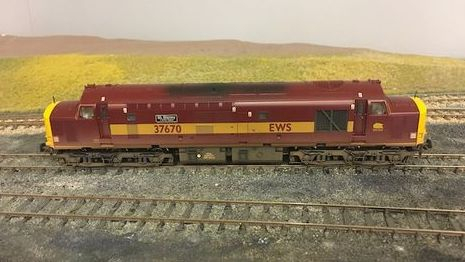 A couple locos in the shed yard. The bridge behind has been moved there to provide access to the tandem point in the forground. It should be in line with the diagonals drawn on the baseboard. 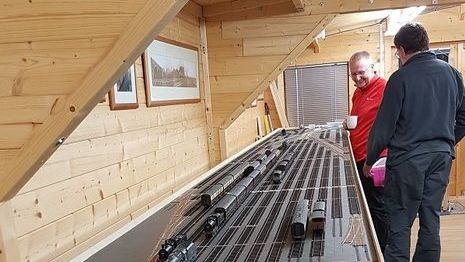 The fiddle yard is as impressive as the main layout even if it isn't fully finished yet. LBH took along a Hall he had purchased years ago for resident expert Morgan to have a look at. One major problem was that we didn't know how it came apart, so a chip could be fitted. Having undone some tiny screws to remove the cab interior, more screws became apparent and disassembly was achieved. 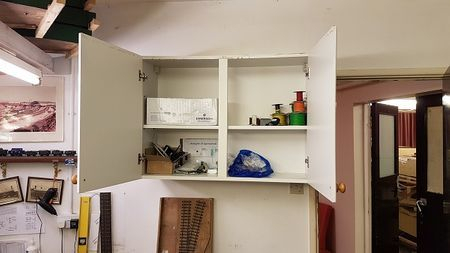 However, there's not a lot of space inside! 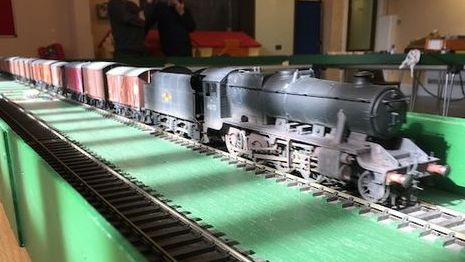 Guest John Harris brought along this rake of ex-GWR articulated coaches hauled by a 56xx tank. One of Wagonman's prial of 517s, this the long-wheelbase version with a suitably varied selection of GWR stock. 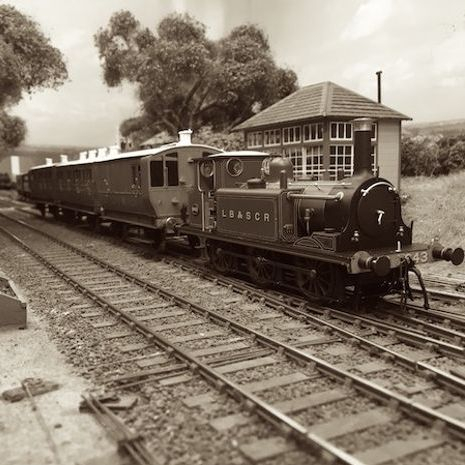 Wagonman's 8F looked very impressive on the fitted van train. 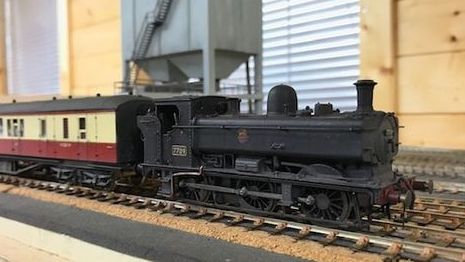 John Harries also brought along this Barry 0-6-2T and brake van. 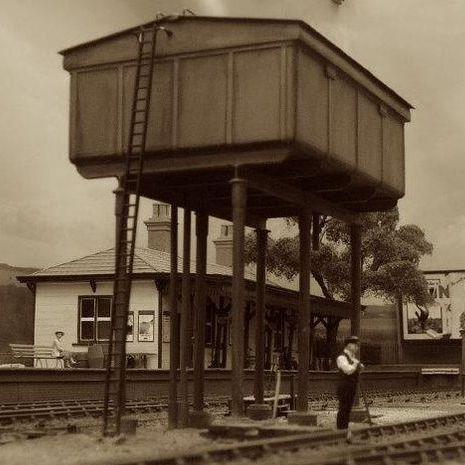 Its always a good idea to have a removable cab roof, although making it stay in place can be a problem. 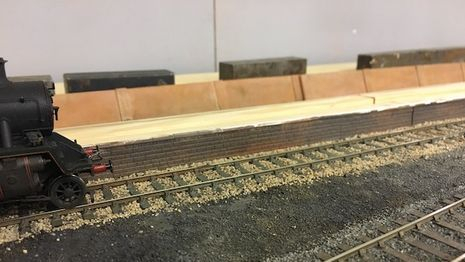 Mr Chairman continued with the groundworks for the line towards the Brickworks. Having installed the buffer stop seen at the bottom left of this view (somewhere back in the late megalithic period if I recall correctly) frustratingly we have recently come across a photo of the siding that proves that our assumption that there was a buffer stop here was false - it appears that there was just a mound of earth there to restrain errant wagons. 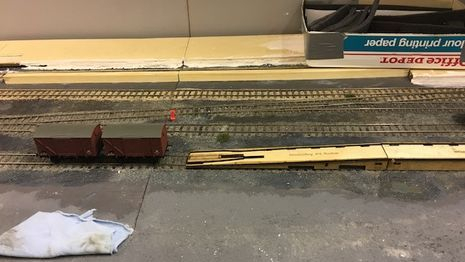 So the buffer stop will need to be lifted and re-used elsewhere. 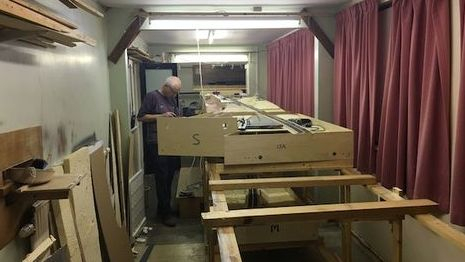 Following up on our plan to run trains from ABB (in the work room) through the hole in the wall to the Fiddle Yard (in the Layout Room) we need to remove the near part of the framing, seen here in the foreground. 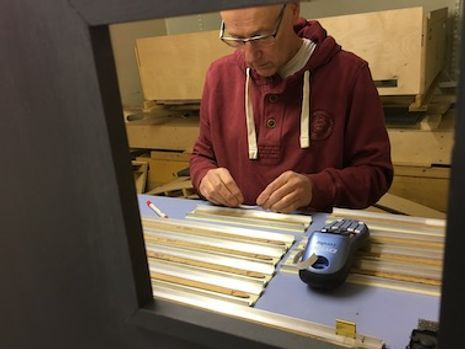 So Mr. Chairman is seen here the re-routing the electric supply in the spine of the frame. 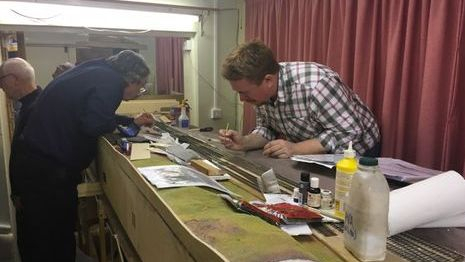 Here we are checking the levels of the Fiddle Yard against the extension piece. We need to jack up the FY a bit, and trim the extension back by about 6 ins. And Mr Wagonman dragged himself away from his four-wheeled friends to continue work on the plarform faces on ABB. On the topical subject of waste plastic, here we have 500 4mm chairs, 250 left and 250 right. 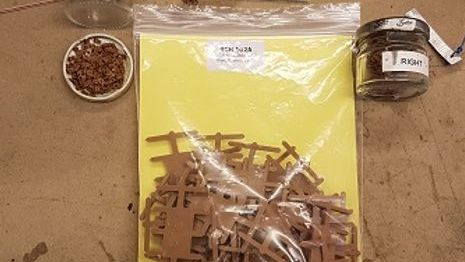 And a large bag of waste plastic sprue they have been cut from. He took off his boots and was sick in 'em. 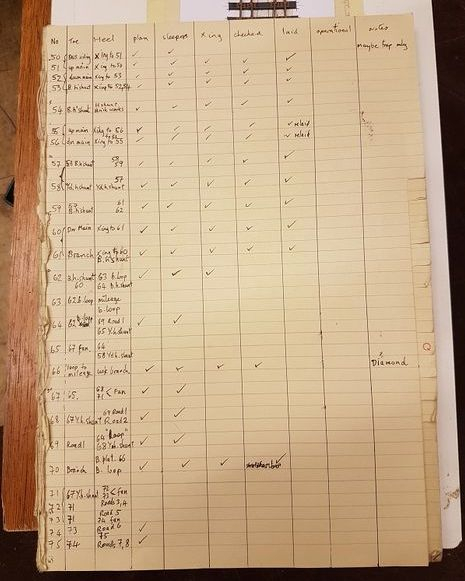 As yet no members have asked to be credited for their part in the composition. 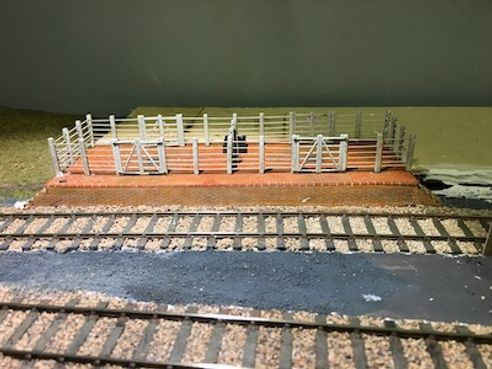 YTS and Andrew have been working on the wiring for Brades Siding while Wagonman deviated from type creating the platforms for ABB. 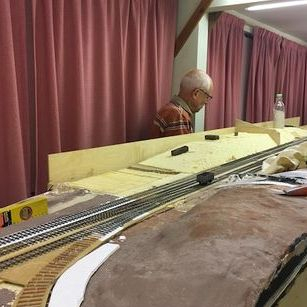 Mr Chairman continued installing the 'bridge' between ABB and the Fiddle Yard (see 21 Sept) and helped LBH with profiling the baseboard sides on LMJ to match the terrain. 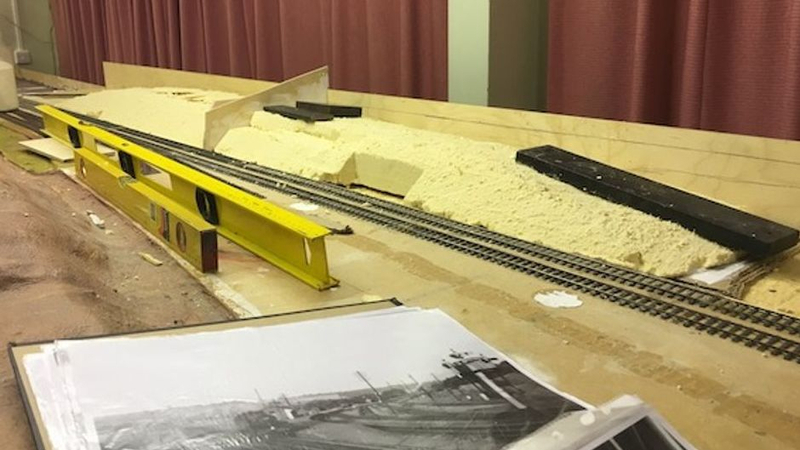 Here Mr Chairman is attacking the sides of LMJ basboards with a jig saw and in the foreground you can see the beginings of the groundworks (the white arc) for the guides on the rope-worked incline to the brick works (this will not be a working feature). A little while (three days in fact) later and we can see the profile taking shape. 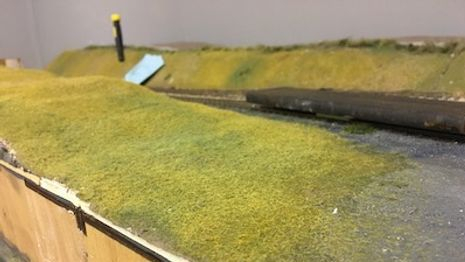 And LBH continued to build a turnout for the new Scaleseven layout, tentatively christened Ysgubor Fach, displying a pitiful (and not atypical) lack of progress since Aug 17th. 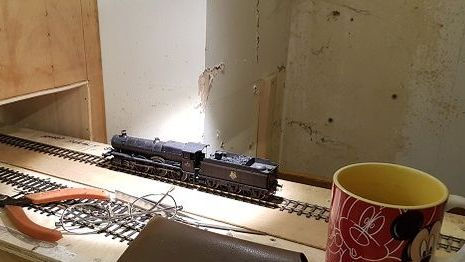 We've decided to put ABB in the workroom where we can get at easily to work on it, but to allow us to operate it we need to connect it to the fiddle yard (which will be in the layout room on the other side of a hole in the wall). However its support beams were too high so had to be dropped. 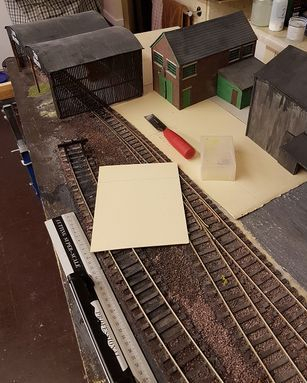 The end of LMJ yard has rail access to the Little Mill Brick Co. 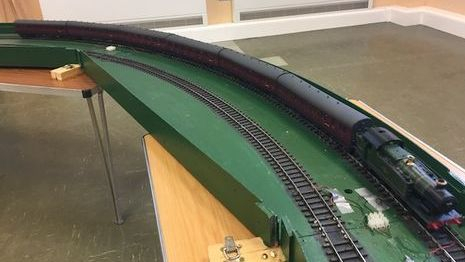 The plans show a line curving sharply towards the works. Without any photograph or other evidence we have assumed a rope worked incline taking coal in and products out. 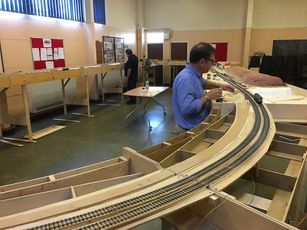 The plan is to have the track there but no actual working. If you are interested in inclined planes and their working I can recommend this book. Some items in it will be used to detail our short stretch. 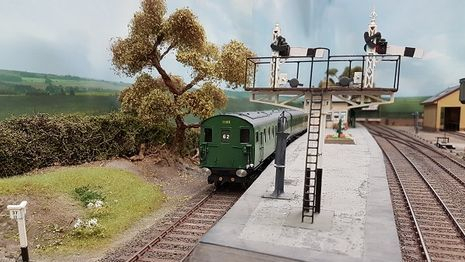 After the business last weekend it was understandably quieter at the club this week but nevertheless we did make a bit of progress on LMJ turnouts and forming the landscape. And Mr Chairman brought his new pride and joy along. The new, (and rather delayed) Heljan Large Prairie. Its been on order for over two years but worth the wait. It will run on Pavilion End probably doing the B-set duty. At the moment the plan is to number it 4110. I photographed it on the last day of passenger operation on the Vale of Neath line. Worked progressed on the contours for LMJ. 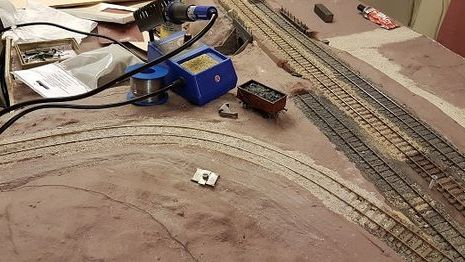 Here we can see the excavation for the signal box and beyond it where a 'shelf' was formed in the side of the cutting, presumably to allow a better view of the line towards Newport. 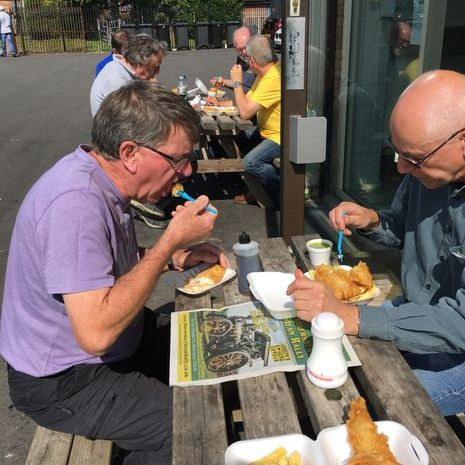 On the way up we HAD to stop for food and found a chippie in Craven Arms. LBH managed to put on five pounds on the weekend and is trying to work out why. 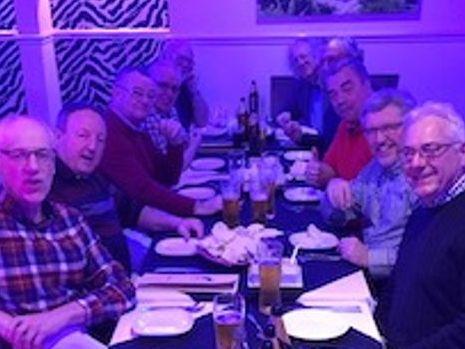 Throughout the weekend YTS was surrounded by those eager to hear his thoughts on BPRC. 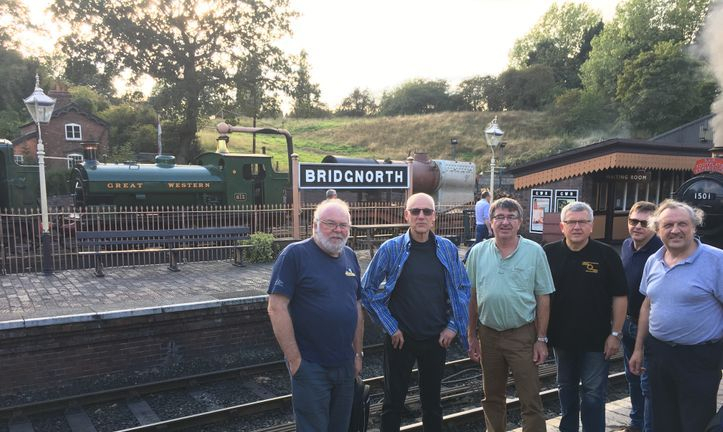 On Saturday we had out traditional after-show visit to Bridgenorth so see the final movements of the day on the Severn Valley Railway, sample a couple of pints in the Railwayman's Arms and a curry in the town LBH was trying to work out how managed to put on the five pounds. Behind us someone has obviously failed to read the instructions when assembling the kit for 813. Interest increased with now seven in attendance / in awe. At the most the crowd got up to eight. Bwthyn y Rhosod had plenty of examples of BPRC. 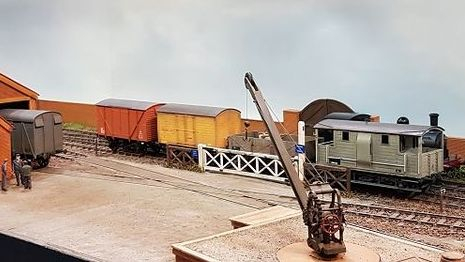 There's the J71 hiding behind the wagons and the crane jib swings left and right, the hook goes up and down, and loads can be lowered into the wagon on the right. 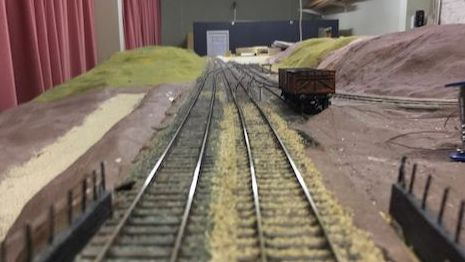 As well as the technical wizardry, the layout itself rightly received many compliments. 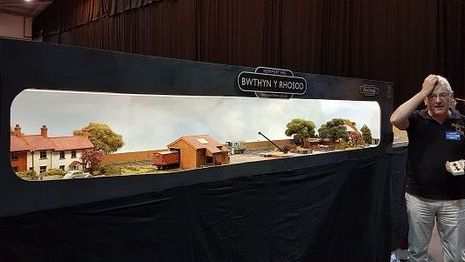 Here's the layout as it was on display at the show on the Sunday. And LBH has finally realised he's eaten as much over the weekend as he would have in a normal week. ... name a town in Belgium after them. Stoomgroep Turnhout run 5 in and 7.25 in live steam every summer weekend in the local park. Its a very pleasant setting. Real coal, real steam, real smell. I've no idea what was the prototype, if any, but it hauled two bogies of passengers with ease. Where the NMRS leads, others follow. 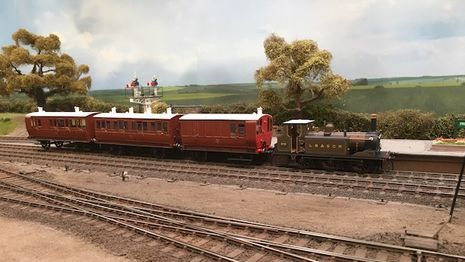 On the left, a view taken last week of a LBSCR Terrier on Frecclesham at the Ross Exhibition. 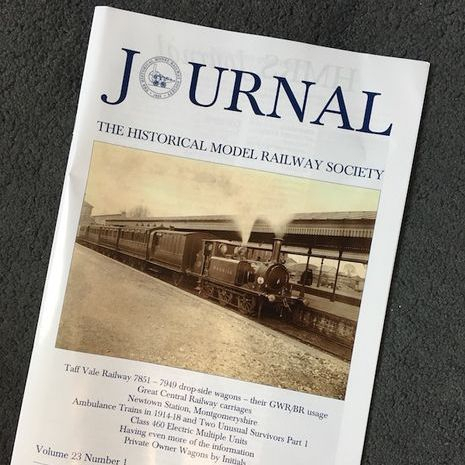 On the right, the cover of the latest HMRS Journal, which arrived in this morning's post. 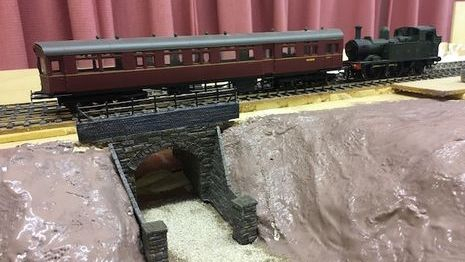 And at the Hereford End, where we need to form another embankment we now have the low-lying terrain as a starting point.. 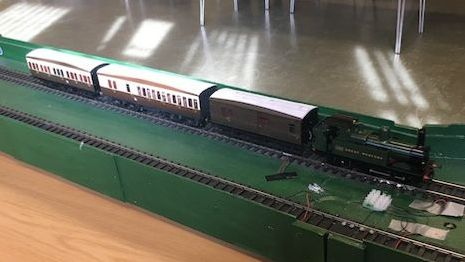 Since June 2015 we have been monitoring the progress of Paul's DEMU 2H/Class 205 akaThumper set on these pages and on Saturday it had its first outing on Frecclesham and it certainly looked the part. Here's another shot with the layout looking empty as it probably would have been by the time diesels were running. 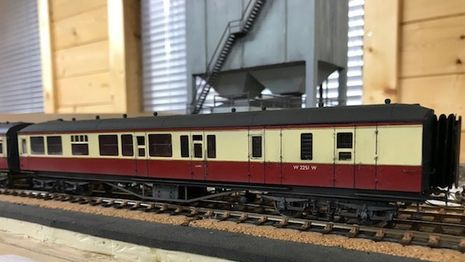 Another first on the layout were Wagonman's delighful LBSC Terrier and Stroudly coaches. And just occationally the station was prototypically quiet. Also spotted at the Ross Exhibition was the single line token for the section between Little Mill and Glascoed. 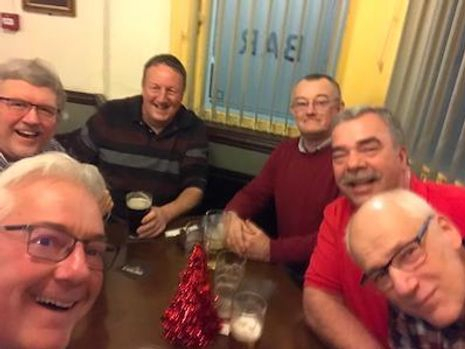 Absent Friends were toasted with the traditional Cold Tea. 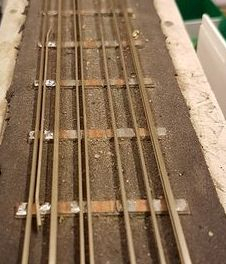 LBH made a start on a 1:7 turnout for a future Scaleseven layout using C&L components. 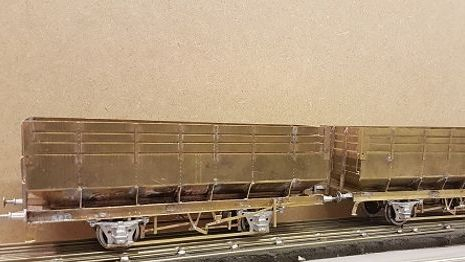 Digging down through several geological strata LBH exhumed this Chas Roberts seven-plank wagon which now boasts Scaleseven wheelsets. Thirty years in the making so far, it's about time he got it finished. 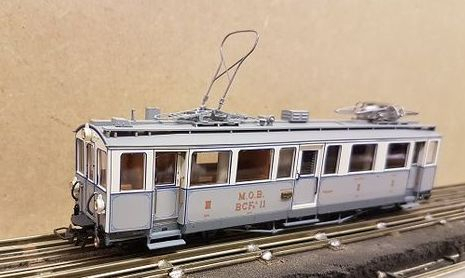 Going back to Tuesday, Al arrived with a selection of stock from the Montreux Oberland Bernois Railway (MOB) in HOm (which is 3.5mm/ft on 12 mm gauge track to the uninitiated like LBH). These beauties are from the Swiss mountains. 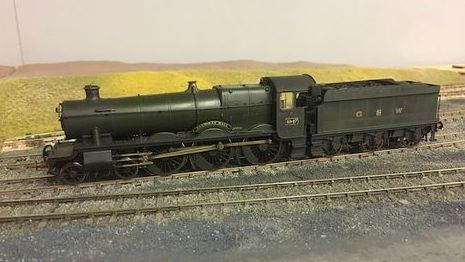 But this one is in 7mm scale. 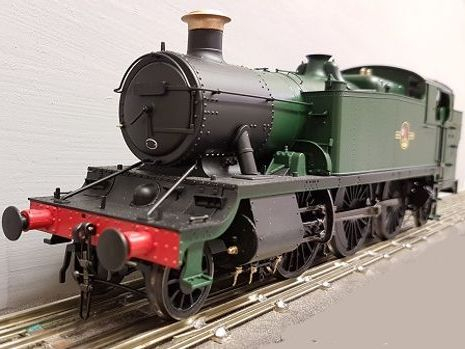 Its a Taff Vale 6 wheeler and is in fact fitted with Scaleseven wheels which mystified Al when he first tried to put it on the rails. 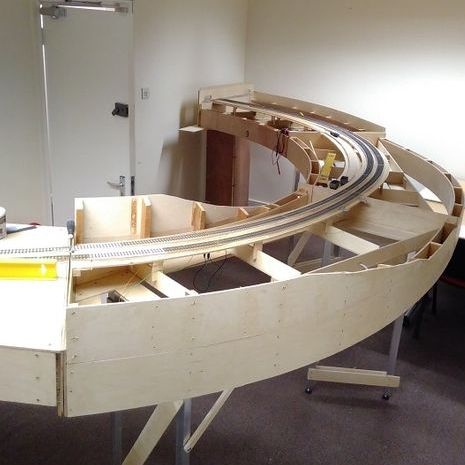 We now have some suitable track for display and testing. 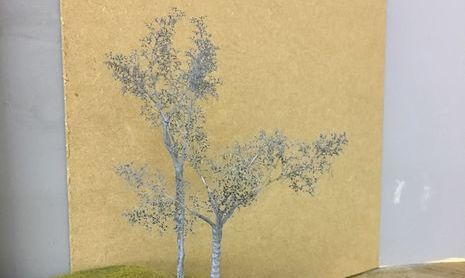 And Mike E is experimenting with a combination of wire armature and sea foam (Teloxis aristata) to model some of the trees we need for Abergavenny Blackbrook. We haven't arrived at the finished article quite yet but things look promising. 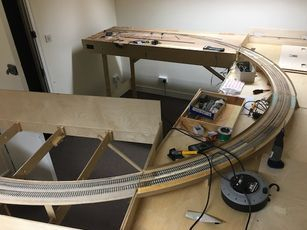 On Tuesday LBH spent a happy hour adding an additional rail to the test track (the short fixed one, not the roundy-roundy O-gauge one). 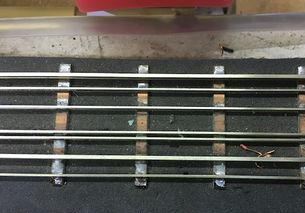 The new rail is at the the bottom of the right hand pic and is set at 33mm from the second rail down to allow us to run Scaleseven stock. 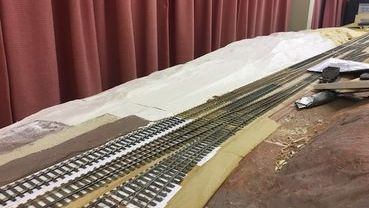 In the view on the right you can see a check rail set to the S7 flangeway gauge of 1mm to allow us to see which wheel-sets pass through smoothly. 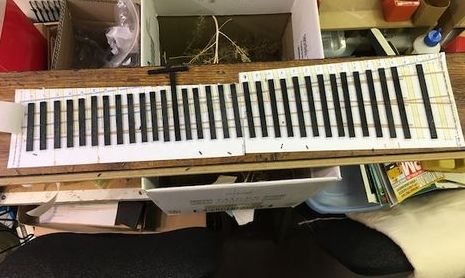 For the record on the left - rails 1 and 6 are at 32mm for O gauge and 16mm/ft narrow gauge; 2 and 4 at 16.5 for OO and HO; 2 and 5 provide for P4 and 3 and 4 are spaced at 9mm for N gauge and OO9. 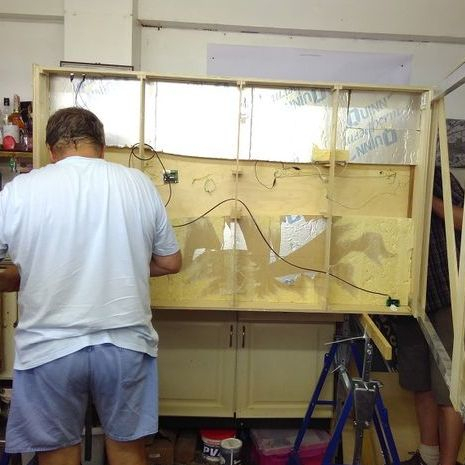 After the Open Day Andrew has been progressing with Brade's Siding. There has been much discussion about building positions and lots of variations tried. This will definitely not be the final spot for the timber store! Card is going down on the surface to allow the buildings to be bedded in. The idea of a curved backscene in the corner is going ahead. 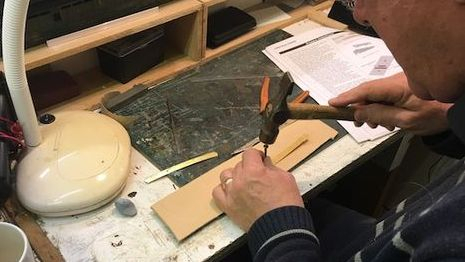 The hardboard has been soaked to allow it to bend. 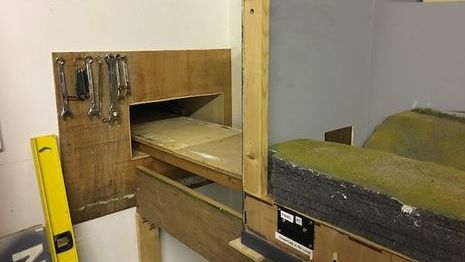 Who remembers soaking hardboard before tacking it to 2 by 1 framing back in the 60s? 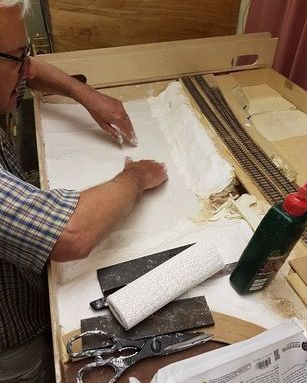 More scenic work, but this time on LMJ, plastering over the foam. This is at the Pontypool end near the brickworks. 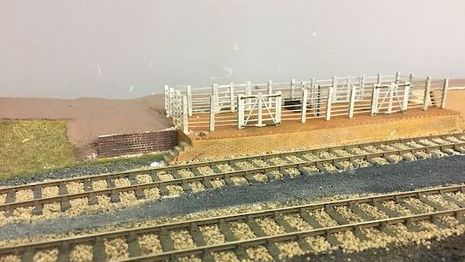 Still with LMJ I decide to make a checklist of the turnouts on the front of the layout. 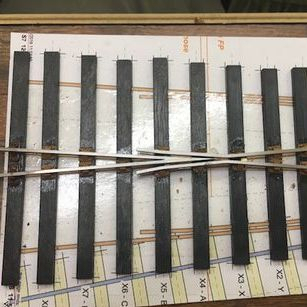 There are 11 already laid and another 8 in progress and only two yet to be started. 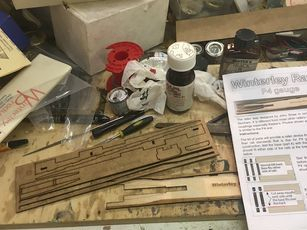 These figures may not tie up to the ticks on the sheet as I also had some turnouts at home on the workbench. So the final count revealed just six more common crossings required. Here's the start of the first of these. 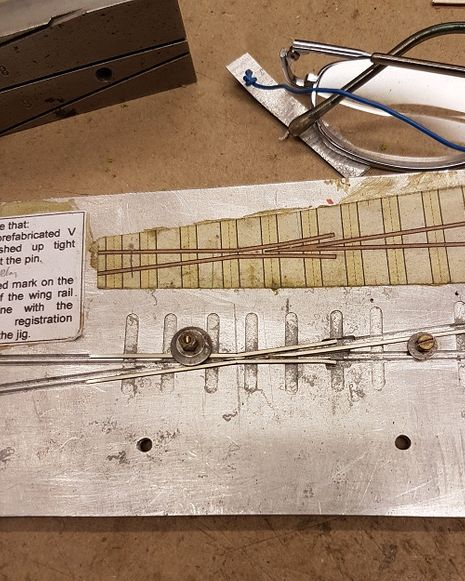 LBH is trying an informal springing system on the delightful Minerva Iron Mink. 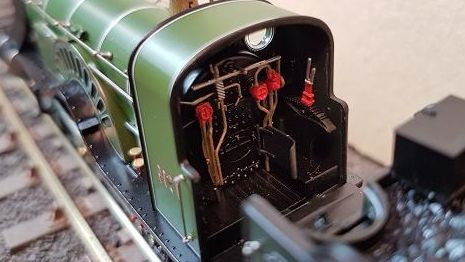 The manufacturer allows for some vertical movement of the axlebox within the W-iron but some means of springing is required to allow them to work properly. I still need to trim back some of the extraneous wire. We'll see how well this works. 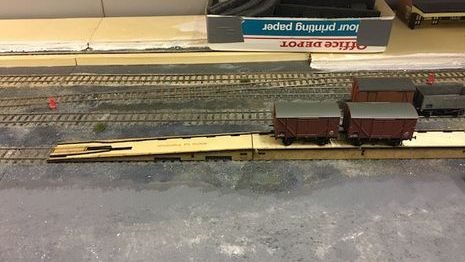 The original Minerva wheelsets have been reset to S7 back-to-back measurement and happily the van passed through the check rail on test track unimpeded, it needs to be tested on a layout now. 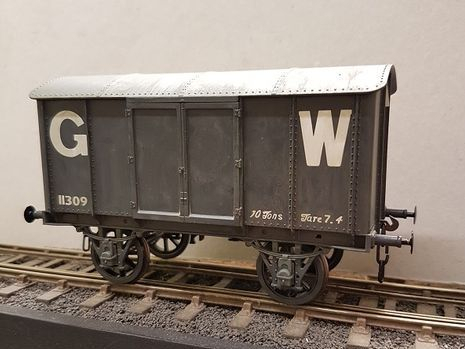 Here we see it the right way up and after a wash with diluted enamels (I daren't call it weathering as that art is so sophisticated nowadays) to tone down the bright lettering. 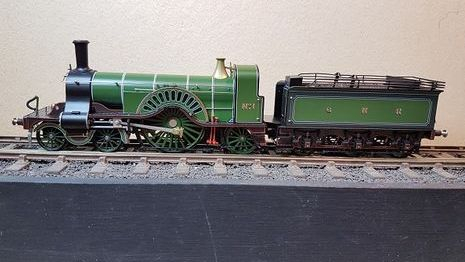 The wheelsets however, which are set for 33mm gauge can't quite cope with the O gauge track. 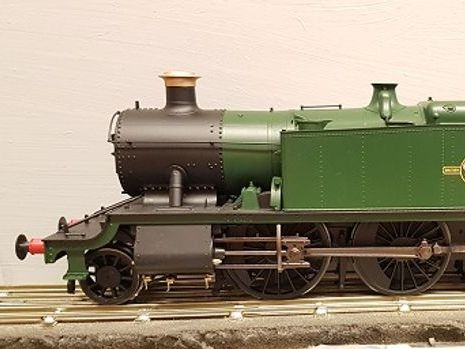 This Friday was another of those days when there was a surfeit of new models, all in 4mm scale. Rob has had these on order from different places for between two and three years, yet they all arrived within a week of eachother. 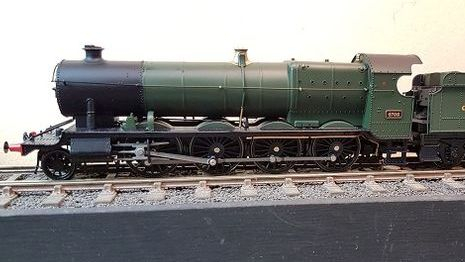 This is a 4-6-0 Baldwin tank from Bachmann. I'm not sure where this fits into Rob's plans - he said he just liked it. 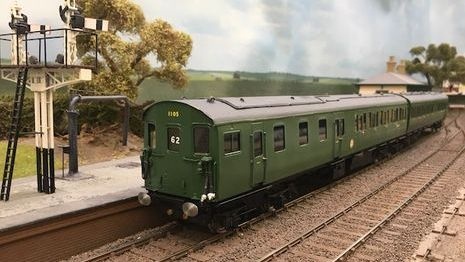 Next is a Stirling Single from Rapido Trains. So graceful when on the move. 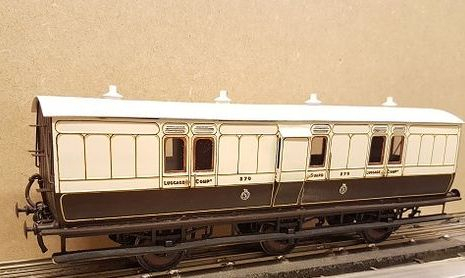 Rapido are promising 6 wheel coaches to run behind it. Very finely detailed . . . Finally, a bit of a beast. This one is from Heljan. Open Day - see its own page here. 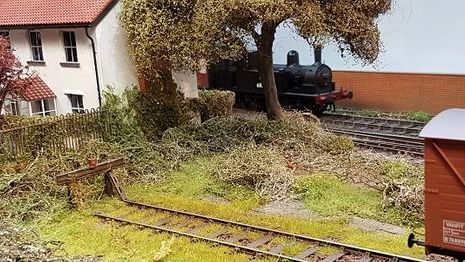 No pics today as we were all beavering away with last minute preparations (cleaning loco wheels, track cleaning, mods to the facia of ABB, some hint of flora to come on LMJ, temporary backscene for Brades Siding, a bit more work on the trees for ABB) for the Open Day. Come along on Sunday and see what we forgot to do. A week to the Open Day and work continues apace with a few ad hoc sessions thrown in on the rewiring and trackwork on LMJ; by Friday we had completed the work on the track fettling and electrics on the Newport end, stored those boards away and erected the four Hereford end boards to perform the same jobs there, meanwhile Wagonman has made good progress on the Hopper as has Mike E on the 'weed' trees for ABB. 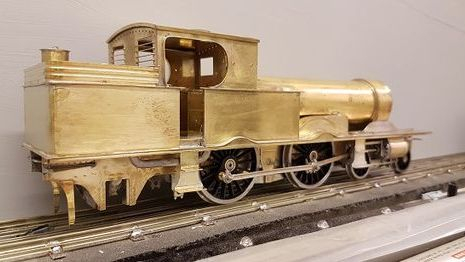 Wagonman's Hopper with the first view of the underframe. 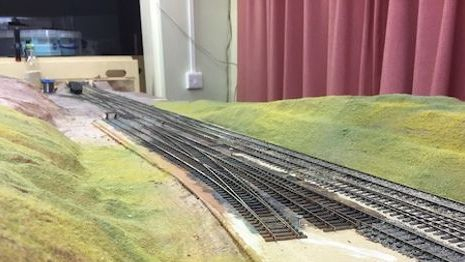 Work commences on the track fettling and electrics on the Hereford end of LMJ. Having this room available, albeit temporarily, has been a boon for us. 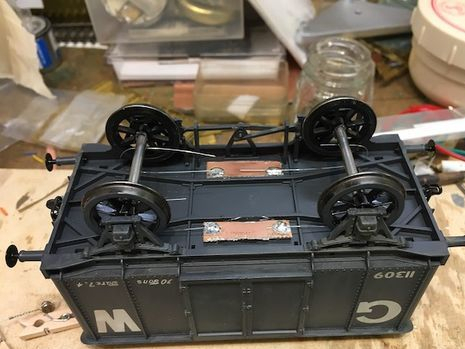 And LBH started assembling a P4 Winterley Railer with the extension piece. 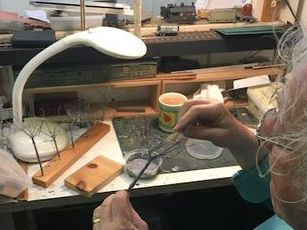 On Friday LBH completed the assemby of the Winterley railers and with the temperature so high in the clubroom the PVA hardened soon enough to test them. 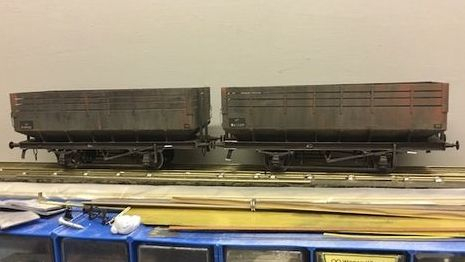 On the left a pair of permaently-coupled covered wagons are on the extension piece (the railer itself would have been too short). 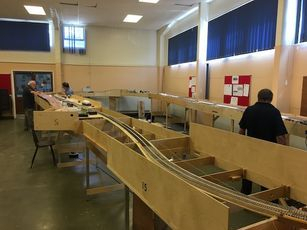 And on the right we have run the two wagons down the ramp and successfuly onto the track. Job done! 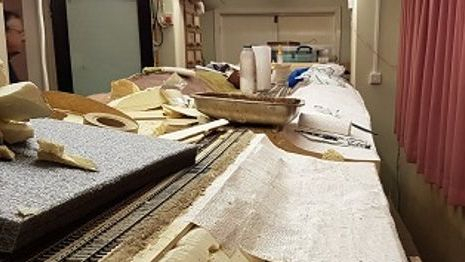 One of the adjacent rooms in the Centre has become temporarily available. 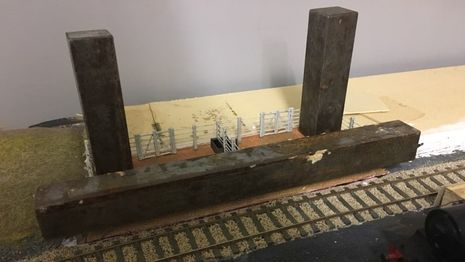 We've taken advantage of this by erecting the four corner boards Nos 6 - 9 ( the Pontypool end) together so we can test and fix such things as wiring and track alignment. We should be able to get three straight boards together in here when these are done. Note that we have the luxury of a carpet on the floor here! 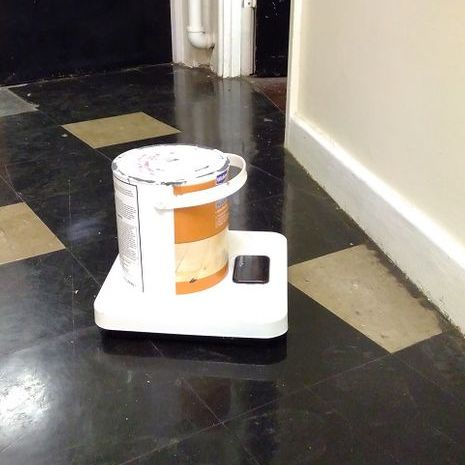 Why are we weighing a tin of paint? Well, we're not, it's to weigh a whole baseboard. If we carefully hold the board on the tin we can read the dial. The board directly on the scales covers the display. Anyway we are at about 25kg a board which means we can now select castors which are sturdy enough. 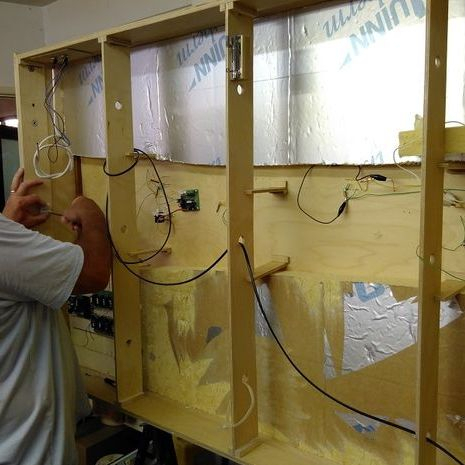 Meanwhile back in the main workroom its on with tidying up the wiring under the boards. The four baords erected in the spare room clear space to easily move boards in and out for attention. 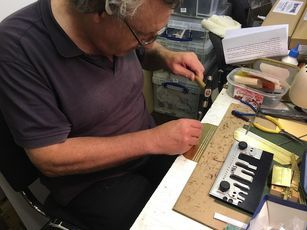 Here Paul is attaching a proper connector strip at the end of the board, much better than just twisting wires together. Note some of the temporary crocodile clip connections that need to be made permanent. With three weeks to go to the Open Day we braved the unseasonably warm weather to set LMJ up and get it running. 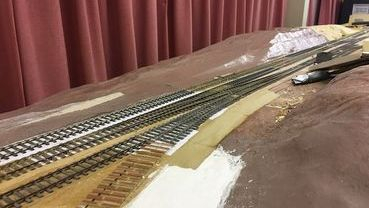 In doing so we found a number of issues and we will need to come up with some bright ideas on how best to make progress the layout. Meanwhile Alaistair too advantage of the lull between erecting and collapsing LMJ to prepare the components for a BR 20 Ton Coke Hopper.